With its modern, ergonomic design, Sculpt Ergonomic Keyboard sets the standard for support and comfort. It keeps your hands and arms in a relaxed position as you work, helping you feel refreshed after a day at your desk without soreness or injury. Sculpt Ergonomic Keyboard is built on advanced ergonomic principles, with a split keyboard layout that keeps wrists and forearms in a relaxed position, and a cushioned palm rest that protects against inflammation and repetitive stress injuries. 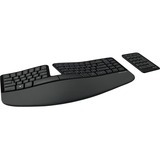 The domed keyboard shape works to reduce and correct excessive wrist pronation that can cause pain and limited mobility. The natural arc layout follows the curve of your fingertips for a more natural way of typing. The reverse-tilt design positions the keyboard at the correct angle to give you a neutral wrist position.